One theory says that 'Horn OK Please' resembles three modes in which a vehicle following another vehicle should interact. The first mode is HORN, if the following vehicle wants to overtake a vehicle ahead of it from the left side then horn should be blown. This way the leading vehicle gets knowledge about the speeding vehicle and does not make a sudden left turn. The second mode is that of OK, if the following vehicle is exactly behind a vehicle, OK denotes that the vehicle which is leading has no problem about the following vehicle and thus middle name is OK. The third and final mode is that of PLEASE, in which the vehicle leading notifies the following vehicle that if it intends to overtake from the right side then it can with no objections. Another theory goes, that The Tata Oil Mills Co. Ltd. (TOMCO), unveiled an economy detergent powder called OK. This brand had a symbol in a shape of a lotus flower. To market this detergent better, it is believed that the symbols were painted on trucks and Lorries. Since the trucks had ‘Horn Please’ already painted on the left and right edges of the back flap, the lotus flower symbol and OK was painted in the center of the flap. That's what got OK in between Horn Please, making it 'Horn Ok Please'. Moving with time, it became a tradition for truck drivers and owners to paint their trucks in such a fashion. The most verifiable theory that we have explored is that the phrase wasn’t always a mere decorative whim of indulgent truck drivers. It originated as a serious cautionary indication during the World War II. 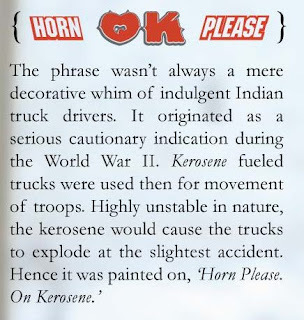 Kerosene fueled trucks were used then for movement of troops. Highly unstable in nature, the kerosene would cause trucks to explode at the slightest accident. 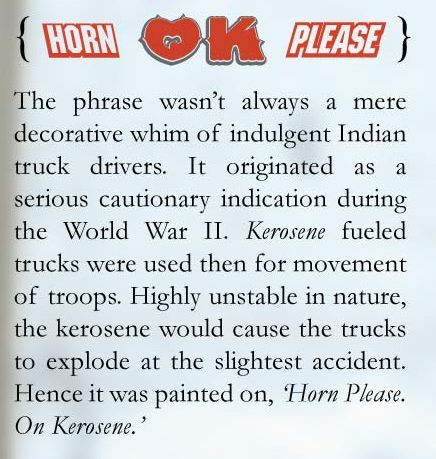 Hence, it was painted on, ‘Horn Please.On Kerosene’. Do you have any other exciting theory about the origin of this term? Please share it with us here on our blog.